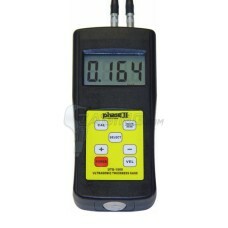 Phase II+ Ultrasonic Thickness Gages are on sale at Gaging.com and are an excellent combination of quality and value! 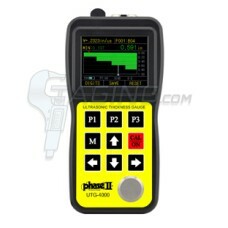 Excellent for non-destructive thickness tests on all types of materials, the Phase 2+ UTG measures thickness by sound velocity. Specifically, the time it takes to leave the probe, reflect on a parallel surface and return to the probe. Surfaces of these materials must be parallel to each other. Please let us know if you have any questions. Measure Smarter with Gaging.com! 5 Year Warranty, NIST Traceable The UTG-1500 Ultrasonic Thickness Gauge comes complete with compact..
5 Year Warranty, NIST Traceable Test steel thickness from 0.01" and up! 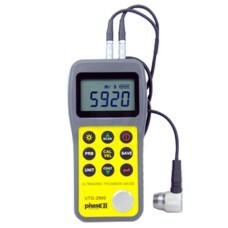 The Phase II UTG-2650 is ..
5 Year Warranty, NIST Traceable Advanced, digital ultrasonic thickness gauge is packed with feature..
5 Year Warranty, NIST Traceable Thru-Coat Capability! 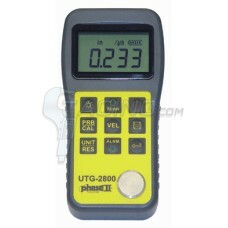 The UTG-2900 multi-functional ultrasonic thi..
5 Year Warranty, NIST Traceable NEW! Color A-scan Waveform Ultrasonic Thickness Gauges! Utilizing ..